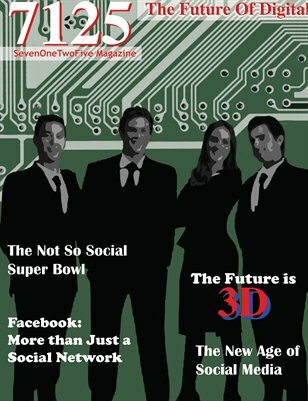 SevenOneTwoFive is a quarterly print magazine, which discusses bleeding edge digital marketing topics. The particular focus of this issue is Social Media, 3D, and Product Placement. This magazine was created by the ALO intern class, at Eboost Consulting. Our focus is to display our thought leadership, on marketing topics of interest, and to discuss what direction, we feel the marketing world is headed.